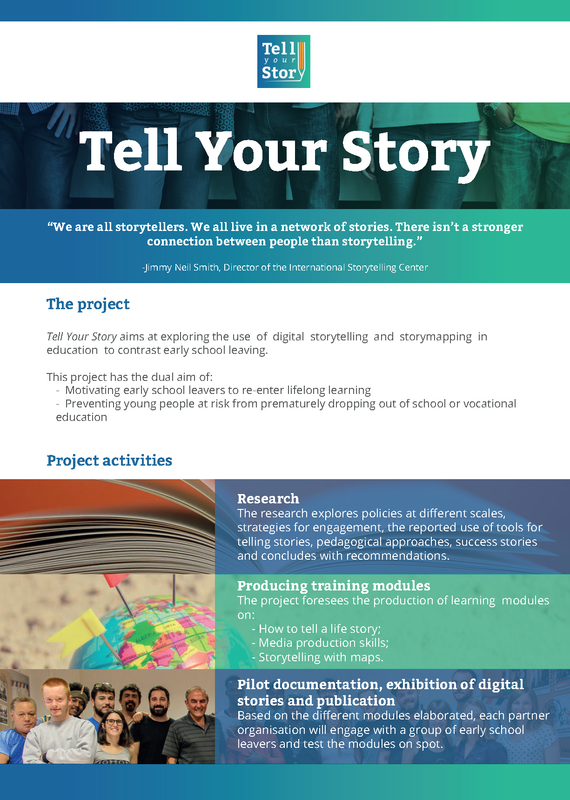 Tell Your Story aims at exploring the use of digital storytelling and storymapping in education to contrast early school leaving. Well-told stories are very powerful artefacts. Digital storytelling is therefore a suitable and effective means for young people to communicate their experiences. Storytelling is defined as a short form of digital media production, which allows people to share particular aspects of their lives. “Media” may include full-motion videos with sound, animation, stills, audio, etc., which individuals can use to tell a story or present an idea. Digital stories are often presented in compelling, interactive and emotionally engaging formats. A recent Web 2.0 development is represented by the use of maps and connected media for digital storytelling; for instance the “Story Maps” initiative has opened the possibility for anyone to tell and share their story (http://storymaps.esri.com/) and in particular, story maps can combine interactive maps and multimedia content into user experiences. Story Maps use geographical location as a means of organizing and presenting information and they tell the story of a place, event, issue, trend, or pattern in a geographic context. Also, they can combine interactive maps with other content-text, photos, video and audio – within user experiences that are basic and intuitive (ESRI, 2014). The project starts with a research phase on the results of previous projects related to early school leavers and on the topic of digital storytelling and mapping. Based on the results of the research, the development of the project will follow. Early school leavers will be trained to gain digital competences; then, they will put them into practice by producing visual materials to be showed to the public. Pilot documentation: Based on the different modules; each partner organization will engage with a group of early school leavers and test the modules on the spot. The Learning module for targeting the early school leavers at risk. An exhibition of digital stories and a publication. The most important is the impact on the beneficiaries themselves; early school-leavers (aged 15-25) will be motivated to re-enter education and training by: – reflecting on their own life stories, the consequences of their decision to drop out, and the benefits of alternative pathways; – increasing their self-esteem through being proud of their capacity to produce and publish high quality digital content; – acquiring key competences (digital competence, communication in the mother tongue, language competence) which increases their employability and may be the starting point new training and career pathways. Adult educators, teachers and youth workers working with young people with a background of early school-leaving will be made acquainted with an innovative approach which is extremely activating and motivating through using the beneficiaries’ inclination towards new media and through boosting their self-esteem by making them the subject and object of digital stories published in the Internet.